I’ll let you in on a little secret. Every holiday is now exponentially more fun with a baby. Like all that excitement you used to have as a kid…… is back. Except this time, you get to be the orchestrator, which if you’re a planner like myself, is the best gig yet. Please, just give me more reasons to make a trip to Michael’s and then cover the apartment in over the top decorations and balloons. For a number of years, the standing tradition with our little New York family, was that we would host Easter at our table and it was full of laughter, champagne and familiar faces…… oh, and someone would always bring a cake in the shape of a bunny. Naturally. You start throwing babies into the mix and holidays are looking a heck of a lot different in our neck of the woods. For starters, no one has passed out from too many mimosas in, I dunno, like a couple of years now maybe. Impressive. Now, I normally believe that a fluffy bunny and a hunt for eggs have literally nothing to do with the sacred and weighty message that is Easter. (But that could be an entirely separate post on our unnecessary need to simplify the significance of holidays.) 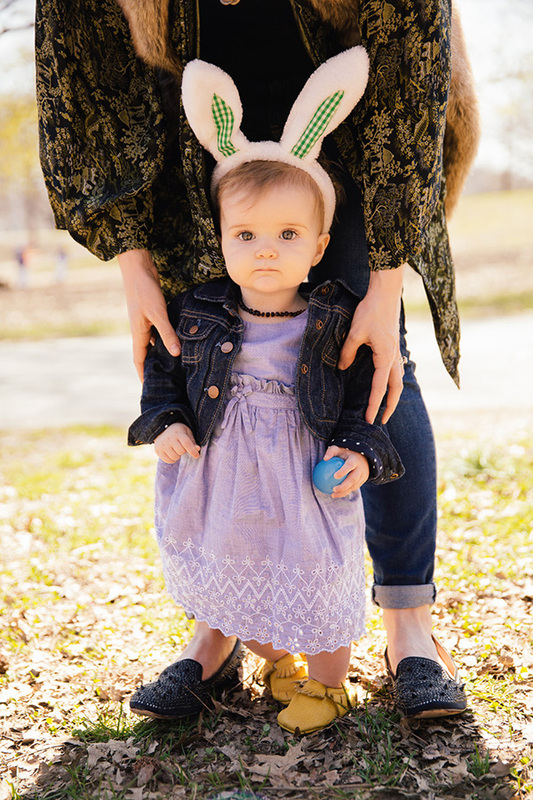 So, moving on..... now that I have a tiny person and she is too ridiculously cute in bunny ears and, if we’re honest, an Easter basket is the perfect use for a mock Anne Geddes photo shoot, I tried to embrace a bit of the basket spirit! Since this is my first go around and putting one of these things together, it was a bit of a crap shoot. Plus, we all know home girl was really just interested in gnawing on the basket more than playing with anything included inside of it. One thing I’ve learned from my now extensive experience in crafting holiday packages for your little ones….. it is the ideal opportunity to throw in a couple of things for yourself. Oh, lookie there…. how did that tiny bottle of champagne get in there? That doesn’t mix well with milk, so I’ll just have to drink it for her. But we can share the nail polish - if she’ll let me! I’m a big fan of these bold and very spring inspired colors that the gals over at Sally Hansen sent for little P and I to try out. They were the perfect addition to her hodge podge of goodies. Do note, her new favorite thing is to ninja roll and push herself across the room. Crawling? She moves like ten inches in the crawling motion and then rolls to the side with a face that says ‘forget this’.... and then just proceeds to egg roll herself down the hall. She’s quite quick and almost looks like a pinball bouncing herself back and forth off of chair legs and whatever else she can get momentum from. I started her down the hall with the basket at the other end, and she successfully maneuvered herself straight for it. I slow clapped for her. This post was sponsored by Sally Hansen and Refinery 29.